I translated the FLC blog today and Kiki talked about it being sewing day on Monday. 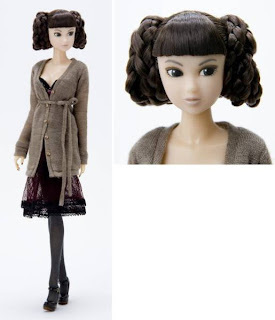 She also mentioned CCS and Momoko, but the reference wasn't clear as to whether they were sewing Momoko clothes or not. I wonder if they are going to make more OOAK Momokos after the ones they auctioned a couple of weeks ago went for such high prices. I got my Doll Coordinate Recipe Book last week and looked through the FLC designs. Yup they are makeable even though I don't read Japanese. However I have to get my PDW design finished by the weekend and another Halloween challenge has to be done by the weekend too. So FLC designs will have to wait. Besides that, the weather is just too nice to be in the sewing dungeon!!! I just finished reading some of the blogs that are written by friends. I am so amazed at the talented writers out there. Wow, they write a blog everyday and it is so interesting and fun, makes me want more, more, more from them. At the left you can see two of my favs, check them out verrrrry interesting reading. I had resisted the charms of the Dynamite Girls, but my resolve is beginning to slip. Well let's just say it slipped big time at IFDC this summer. I was not sure about the first DGs, sorry David, but I liked their style and clothing, but they seemed a bit too anime for me. I know this sounds bad coming from a person with hundreds of Jennys and Liccas in her collection, but something didn't click for me. However, when I saw the first FR dolls AND the first Misakis, none of them forced me to rush out and buy them either. For Misaki it was the Patent Please, Sassy Stripes and Get Graphic girls that hollered my name, and in the case of Patent and Graphic they are still hollering, only Sassy has found her way here. In the case of the FR dolls, I thought they all looked like they were have a fainting spell and their eyes were rolling back in their heads. But when the wigged dolls came out, the FR girls seemed to have had some eye surgery. This time I LOVED them and had some catching up to do. So it was with the Dynamite Girls. When I saw that cute Rufus Blue at IFDC this summer and then Spooky Sooki, I gave up and surrendered to them. So then I went back and looked at the first girls. My daughter had bought one and I realized that she was very cute, not at all anime like she had looked in the pics. So once again catching up with the DGs. The latest editions, Eltin and Jolly Jett are absolutely stunning. Well here we are into the fourth day of the challenge. I think I know what I am doing and my design is done. Now to draft the patterns. Sorry that's all I can say for now, hehehehe!!! 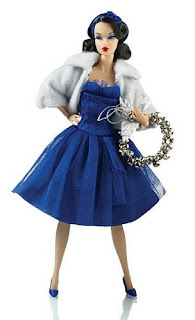 For those of you that don't know.....there is a challenge group called Project Dollway. 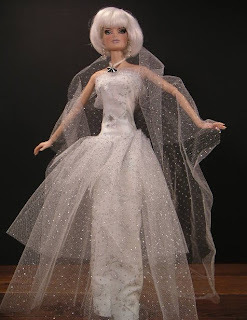 It is the Project Runway of dolly designers. This idea all began about a year ago with Ted Menten hosting the first PDW. There were a number of designers and it worked the same way as PR with eliminations each week. The winner Andrea Jacques is going to have her collection produced. Running at the same time, the people who were watching at home and were brave enough, could do the same challenges as the designers. I actually did two of them. That's one of them to the left. It was the FR challenge and our keyword was moonlight. Well after PDW finished, we were out there in no man's land........then tada!!! Gabby to the rescue. PDAH is all about home designers. There are 31 designers. There are no eliminations(thank heavens or I would be out the door the first day!!!). So spurred on by my outfit winning second place(my daughter won first, sheesh) at IFDC this year and the positive comments of many people who saw the outfit, I entered PDAH. It will be hectic and I don't know if I will get to document all the ups and downs, but I'll start. There will be twelve challenges, all one word. When we got our first clue...VINTAGE...I really didn't know what to think. I read all the posts on the group list and I still didn't know what to think. I have been thinking and thinking and I have kind of an idea forming, but we only have two weeks to complete the design and sew it into existence. Well I'll give it a try because it sounds like fun and fun is what this challenge is all about according to our fearless leader Gabby!!! So as to not give away anything, I think we are supposed to post our thoughts on the challenge after the due date for each challenge..........I'd better get a pen and paper, well maybe I don't want to remember some of these thoughts!!! LOL!!! Licca came into exsitence in the 1960s. She is 11 years old. 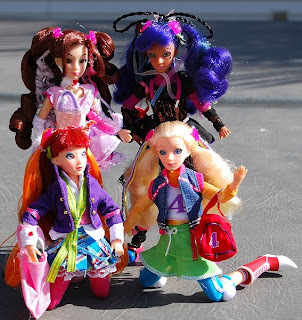 The list of dolls in Licca's family include her parents, twin sisters Miki and Maki, triplet siblings, Gen, Kako and Miku, and her long lost older sister, Rie(who is an airline stewardess). There are also Licca's grandparent and several cousins. 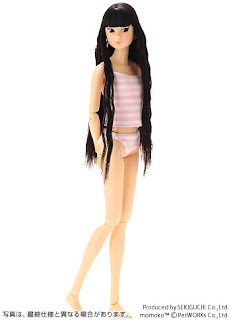 Licca also has a large number of friends, boyfriends, maids, her music teacher and her doctor. 1997 Licca is a Mother. The Sets came in three versions, Blue, Pink and Yellow(yellow was the hardest to find). There was also a separate Pregnant Licca set, with Licca and baby, sold. I think I am going to overhaul this whole darned website top to bottom. Now I am re-vamping Susie's pages. Oh well I always said it was a work in progress. Speaking of which, I am now knitting sweaters in 11.5 and 16 inch scales. I got this pattern for this very cute Christmas tree ornament which is a little sweater. However when I knit it up, it is 1/6 th scale, but the needles they called for were so big, that the stitches are very large, so now I am in the process of re-working the pattern and trying to figure out how to use smaller needles and get the proper size. This is no mean feat as I have actually no idea what I am doing. This will be an interesting project...hehehehe!!! I really am a sucker for dolls in historic or traditional costumes. 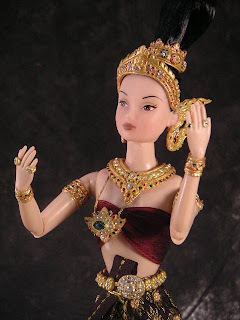 The picture is Sukothai Muse from R&D's Legend of Thai series. They finally arrived this week. They are made by Jakks Pacific. They are about 10" tall, about the size of my re-bodied Mamemomokos on the Volks mini body. They are fully articulated, however the joints are a bit loose, but even that doesn't stop them from standing on their own. The biggest thing I have against them are those eyes. They have the "deer in the headlights" stare. If the eyes could be toned down these gals would be really cute. Note the pic of Audrina close up. However they are the right size for the Rement house too and can join the rebodied Mames as roomies. I love to knit and I just found the coolest shop that stocks tiny needles and sock wool. Sock wool is the best scale for knitting for dolls, especially 11.5 and 16 inch dolls. For those of you who don't knit, but can sew, a really cool tutorial was just posted on a list I'm on about sewing sweaters from socks. Even though I can knit, I thought I might just like to try this out. I am still working on the OOAK page, that will take some work and I might have to shed a few tears over the FLC dolls I couldn't buy. Oh well, at least someone I know has a really good chance of getting one. He is top bidder with 8 hours to go. She's not his first choice, but what the heck, she's an FLC. I just check on the FLC doll that I really, really wanted and yeah, not going to happen.......she is at 501,000 yen, which is approximately $5,000!!!!!!!!! OMG, this person must be made of money. Either that or this is the first doll they have bought and they are spending all their life savings on it.......go figure. I'm off to find the Doll Coordinate recipe book. Got some really cool remnants at the fabric shop today. Design time!!! Yesterday I got an email from Sekiguchi announcing their two new Wake Up Momoko dolls, numbers 003 and 004. I didn't get 1 and 2 because they just didn't appeal to me. They were kind of boring, but with most Momoko dolls, even the boring tend to grow on you and you find yourself looking back and thinking, why didn't I buy those girls. Well that happened the other day when I was looking at an auction for the WUD clothing and I thought, you know these ARE really cute. So I guess I will have to go and find 1 and 2 and put my order in for 3 and 4. They are actually cuter than 1 and 2, but don't tell Momoko!!! I would imagine that a new set of outfits for these two new girls will be produced too. After all there are only three WUD outfits and now 4 girls to wear them. Haven't heard anything about them though. These gals too, are lower in price(approx. $60 as opposed to $135 for the regular dolls) and just might make perfect candidates for those FLC OOAKs I talked about in an earlier post...........I'm getting that hmmmmmmmmmmmmmm feeling again!!! Well, I watched and watched and the price soared on my FLC fav from round 1. She went for 280000 yen, which is approximately $2500!!! OK that's a little too much when I only paid that for BOTH DHEXl and DHEXs. So now I am watching and watching the second set of FLC on Yahoo Japan and my fav(that's her pic up there) this time is already up to 81000 yen(about $800) and this is only the first day. The one I like the least is at 31000, so I just might bid on a doll I don't care for just to say I got and FLC........hmmmmm. 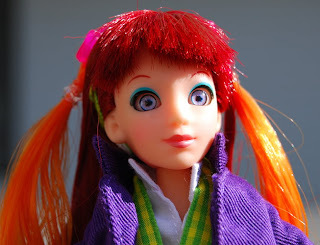 My daughter is really good at repaints and re-roots and I can sew really well and have the fourth Doll Coordinate Recipe book, so maybe I will just have to make an FLC of my own!! !